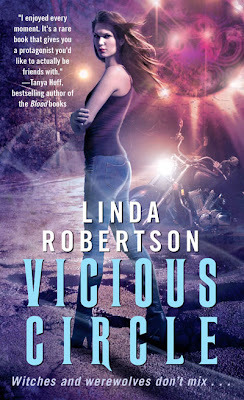 Juno Books posted the cover for Vicious Circle by Linda Robertson today, a new urban fantasy release coming June 30. A sequel Hallowed Circle is slated for December with Dead Circle due out sometime in 2010. Being a witch doesn’t pay the bills, but Persephone Alcmedi gets by between reading Tarot cards, writing her syndicated newspaper column, and kenneling werewolves in the basement when the moon is full—even if witches aren’t supposed to mingle with wolves. She really reaches the end of her leash, though, when her grandmother gets kicked out of the nursing home, and Seph finds herself in the doghouse about some things she’s written. Then her werewolf friend Lorrie is murdered . 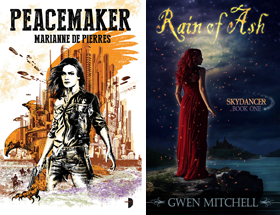 . . and the high priestess of an important coven offers Seph big money to destroy the killer, a powerful vampire named Goliath Kline. Seph is a tough girl, but this time she bites off more than she can chew. She needs a little help from her friends—werewolf friends. One of those friends, Johnny, the motorcycle-riding lead singer for the techno-metal-Goth band Lycanthropia, has a crush on her. And while Seph has always been on edge around this 6’2” leather-clad hunk, she’s starting to realize that while their attraction may be dangerous, nothing could be as lethal as the showdown that awaits them.